Make sitting around the table for that family dinner a bit more fun with this collection of Festive Dress Up Napkins, the perfect lap accessory to put smiles on even the most scrooge-like people this Christmas. This napkin set contains 24, 2ply paper napkins in a variety of 4 designs. The designs included Santa Claus shorts, Christmas Pudding boxer shorts, Elf skirt and Holly boxer shorts. Each napkin is designed to be unfolded and placed on the lap to create a ‘dress-up’ factor to any dinner or party. 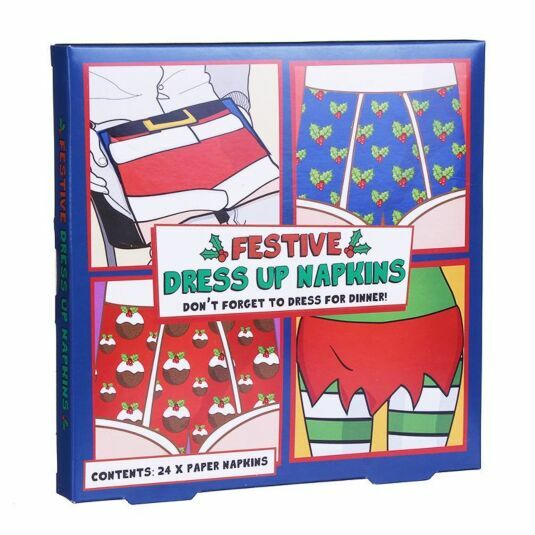 This Festive Dress Up Napkin Set comes presented in a vibrantly illustrated box, making them perfect for gifting to someone before, or on Christmas Day to add laughter and smiles to everyone’s faces around the table.